Is it because they are so hugely ferocious or because of the mystery surrounding their extinction or because of their (supposed) resounding roar? All I know for sure is these ideas make for a terrific boy birthday party theme that never misses the mark. Cakes and cupcakes, invitations and favors, games and decorations, all combine into a colossal party that makes boys roar! Amy from Coffee, Crafts and Cupcakes worked with Jess, over at Party Box Design, to throw a super-sized, backyard, dinosaur bash for Amy’s six-year-old son. Don’t miss out on this gorgeous modern dinosaur birthday party. 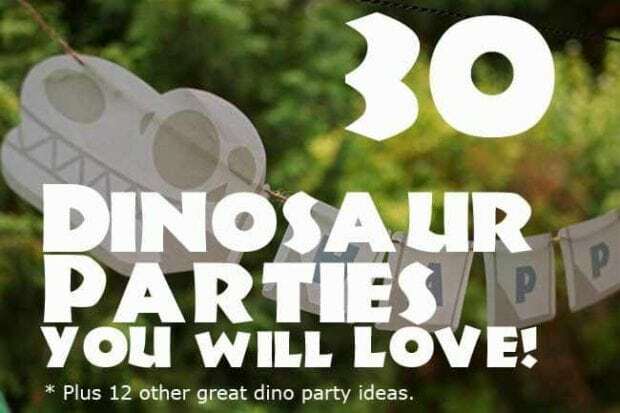 Check out these 10 dinosaur party must-haves. A balloon and pom decorated party canopy not only provided a focal point, but afforded shade as well. Yellow, green, and orange, with contrasting brown accents, coordinated well with the great outdoors to provide some prehistoric party ambiance. Burlap and brown/white chevron added visual texture too. Celebration pennants hanging from the fence posts were punctuated with colorful dinosaur masks. Lunch was simple finger foods. Peanuts, candy, Oreo popcorn, dinosaur cookies and birthday cake filled any remaining empty tummy spots. Distinctive “Extinction” Ale, water bottles in dinosaur wraps and lemonade quenched thirst. In addition to imaginative dino play, a burlap covered sandpit offered a spot for dinosaurs to dig. After a full afternoon of sunshine and friendship, Amy sent her guests home with fantastic favor boxes. The take-out boxes were dressed in party colors and they were full, too; little paleontologists discovered themed stickers, rings, masks, dinosaur figures and a dinosaur pincher (bet that was fun!) — in addition to a custom made dinosaur cupcake bath bomb. Bet they all roared with appreciation!